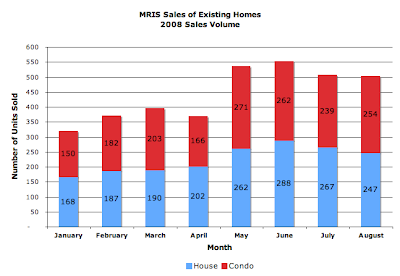 MRIS released its data for signed sales contracts for existing home sales in August 2008 a few days ago. 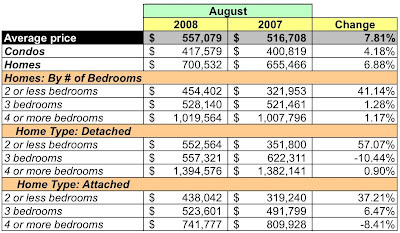 Compared to August 2007, fewer units sold, there was lower dollar volume, but average prices for single family homes and condos rose. The number of units going under contract in August compared to July rose 6.28% for condos and fell 7.49% for homes. Unit sales and dollar volume for condos were down, 29.05% and 26.08% respectively. Homes were down 11.71% on dollar volume and 17.39% on unit volume. 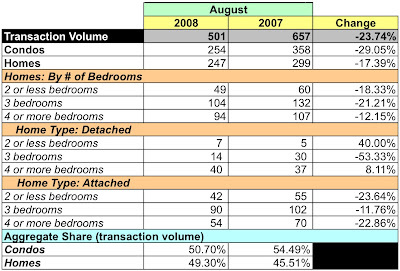 Interestingly, homes increased their share of aggregate unit and dollar volume YoY. 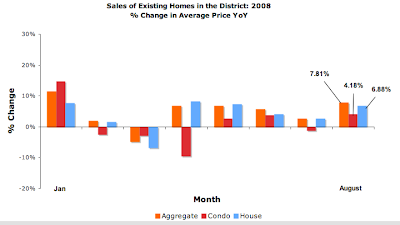 Compared to January 2008, the aggregate average price in the District has risen 0.1% [August compared to January]. Average prices for condos are down 2.15% for the year while those for homes have risen 4.19%. Based on August's sales volume, there's now 5.7 months of inventory for condos and 7.18 months for homes, a decrease of 13.33% for condos and an increase of 7.07% for homes. Compared to August 2007, the number of condos listed has fallen 2.2% and risen 13.9% for homes. 2. 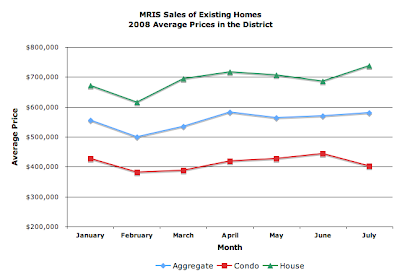 What is the delta of average condo sale price year-to-date for 2008? What about since last August, or even since the beginning of 2007? sorry--I just saw that you have year to date sale price data for condos. I don't know how I missed it before. I'm still curious about how condo sales prices have moved since April 2007, but I think I can get an answer from your numbers. I wonder if the inventory of condos declined because many condo owners decided to rent their units rather than sell them.